Did the allied army of the Orient contain a brigade of Portuguese troops ? Just found myself on the Wikipedia page for Salonica, and the Portuguese were listed. Could be a spoof entry. Not that I know about, there are others on here far more knowledgeable about Salonika than I, so they may confirm or deny Wikipedia. As far as I am aware the only Portuguese troops to fight in WW1 were on the Western Front. Sorry, I forgot the minor skirmishes between Portugal and Germany in Angola and PEA. 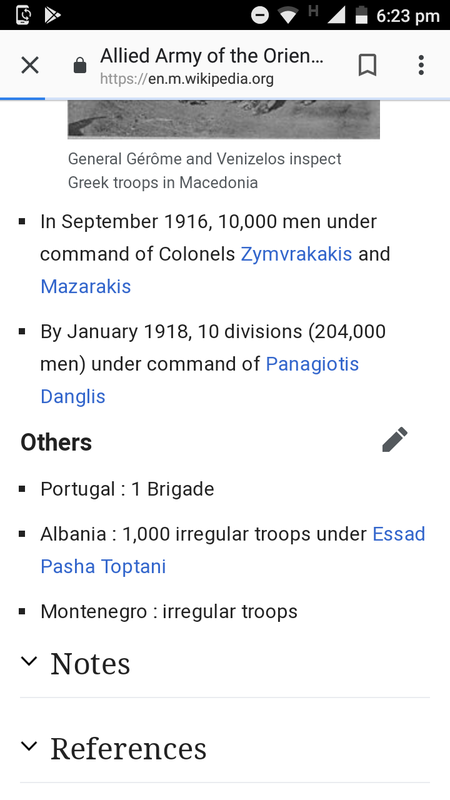 I have read fairly extensively on the Balkan campaign and I haven't come across any reference to Portuguese troops, the 1000 Albania irregulars under Pasha were certainly there. Read a few books over the years about Salonika, but never seen any mention of a Portuguese brigade being sent there. Perhaps some officers , but not anyone else.